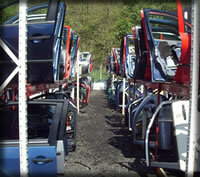 Quality guaranteed re-cycled parts for local distribution by our own transport or nationally by courier. Please contact us to enquire about specific parts or delivery to your area. our knowledgeable staff are more than happy to help you find what you need. With a reputation for service and quality, our aim is to constantly improve our service levels for our customers and suppliers alike. To check our current stock for a specific part please complete the form below, contact us on Telephone 01896 753681 or email parts@sithomson.co.uk.